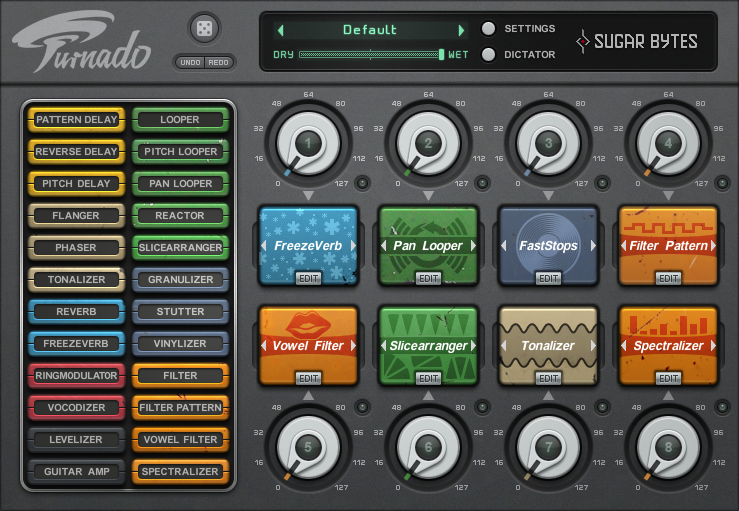 The Relab Reverb Suite is a one-stop solution that includes all Relab Development reverb plug-ins. The Relab Reverb Suite includes: LX480 Complete, LX480 RHall and VSR S24. The LX480 plug-in is an accurate emulation of the Lexicon 480L, one of the best sounding reverbs ever built. Relab Development promises that the LX480 plug-in is not only an accurate emulation, but also, a plug-in that will set the new standard for reverb plug-ins in the future. The VSR S24 plug-in is an exhaustive stereo emulation of the iconic high-end TC Electronic VSS6.1 algorithm for both music and post productions. VSR S24 is the first professional reverb with multiple selectable reverberation engines which can completely change the overall spaciousness, color and reverb characteristics to simulate any environment accurately. Released in 1986, the Lexicon 480L Digital Effects System has been the standard by which all other signal processors are measured. The 'Lexicon' sound is notorious among producers and sound engineers. 30 years later, it remains a popular choice among top producers. The LX480 plug-in's goal in its creation was to preserve the sonic quality of the 480L. The algorithms in the emulation are sample-accurate compared to the original unit, making the LX480 the most authentic hardware emulation available. The LX480 does not stop at perfectly emulating the sound of the 480L. The plug-in includes extra functions such as: parameters for better sound shaping, a high-density algorithm and exhaustive modelled input and output stages. The user interface for the 480LX is based on the LARC (Lexicon Alphanumeric Remote Control) from the original unit. The GUI is divided into: the display, the preset and setup controls, the function keys, the control sliders and undo/redo buttons. The display section gives visual feedback on edits made with the control sliders, as well as allowing direct editing of parameters using the mouse. 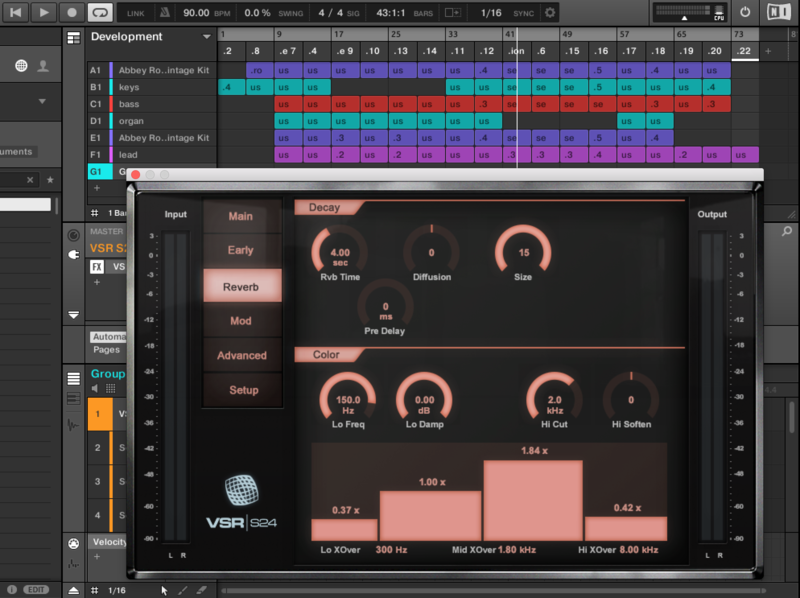 The 'REVERB' tab gives the user a broad representation of the development of the reverb over time. The time axis display can also be rescaled independently using the scroll bar above the graph. The 'EARLY REF' tab shows the volume, pan and timing of up to six early reflections. Comparing the location of each delay marker against the scale at the bottom shows when each pre-echo occurs, and the time axis can be rescaled using the scroll bar above the graph in the same way as on the 'REVERB' tab. 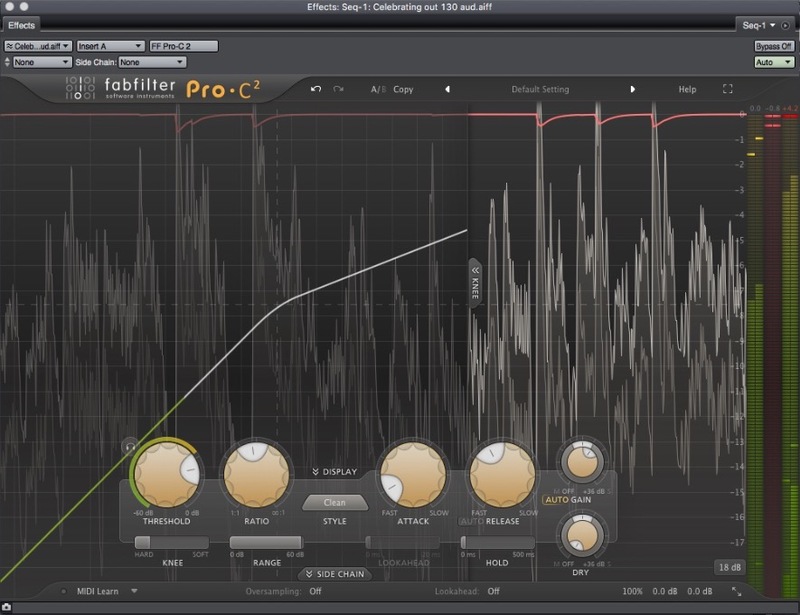 The 'TIME/FREQ' tab shows a graphic representation of the adjustments made to reverb time for higher and lower frequencies and allows these parameters to be controlled. The 'FILTER/FREQ' tab shows a graphic representation of high- and low-shelf filters that are applied to the processed signal (both reverb and pre-echoes). The top row of buttons is used for preset management and overall plug-in settings and preferences. Use the 'load' button to explore downloaded presets. Use the 'save' button to save new user presets. The 'A' and 'B' buttons control which of two engines is currently be edited. The 'SETUP' page includes four options: Single, Cascade, Mono split and Stereo Split. The 480LX includes 8 function keys, these keys include: Quick, Time, Shape, Filter, Mod, Den, Ertl, Ervl. Each function key has a set of parameters that can be tweaked using the sliders below the function keys. The 480LX is made up of several different types of algorithms. These algorithms include: hall, plate, room, twin delays, panorama, random hall, RHall HD and Ambience. 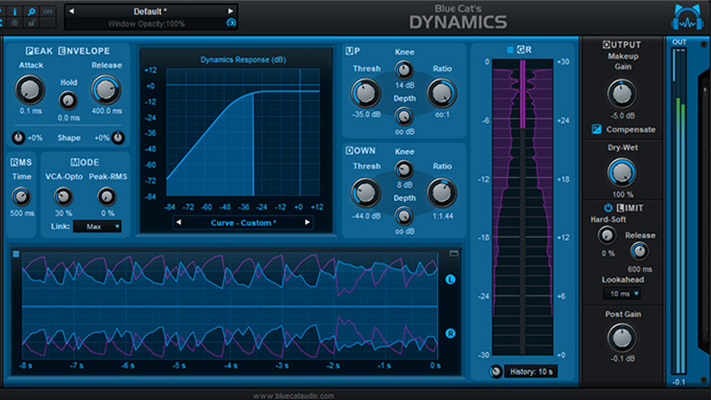 The algorithms in LX480 Reverb provide emulations of the reverb, ambience and delay algorithms found in the 480L. Because current CPU processing power is way ahead of the processing available in 1984, it has allowed Relab Development to make improvements to the original algorithm. Some of these improvements include: greater density, highly advanced echo system, better low frequency reverberation and more stable imaging. The 'ambience' algorithm is designed to become part of the input signal, rather than adding a cushion of reverberance that sits behind a clear direct sound. The 'ambience' algorithm is ideal for adding a room sound to recorded music or speech. The original hardware which VSR S24 emulates aimed to create an impression 'comparable to real-world mono or stereo sources positioned in an authentic or virtual space.' 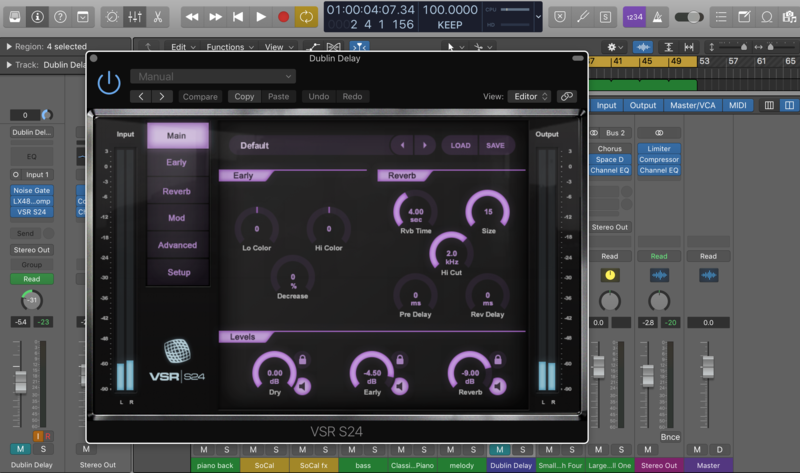 VSR S24 is a faithful recreation of a very high-end set of algorithms for both music and post-production. VSR S24 excels at applying 'prettier than life' reverberation to tracks and busses. It adds complex Early Reflections as well as an uncorrelated diffused response to the signal. The user interface of the VSR S24 is organized into tabs. The tabs are: main, early, reverb, mod, advanced. The 'main' tab provides access to all the most commonly-used parameters. It is divided into four sections: presets, early, reverb and levels. Note that the parameters shown in the Early and Reverb sections also appear in the 'early' and 'reverb' tabs. Changes made on the main tabs will be reflected in the values shown in the other tabs. Instead of a simple wet/dry mix, the VSR S24 allows you to mix the dry signal with separate amounts of early reflections and diffuse-field reverb, with a dial for each signal. The Early tab is comprised of controls that include: type/location, variation, position, ER decrease, start, stop, color. Each user has several different locations to choose from: jazz club, concert hall, vienna hall, bath room, parking garage, living room, theater, castle hall, church, cinema, and oval room. Each location can be set to a front or rear position. 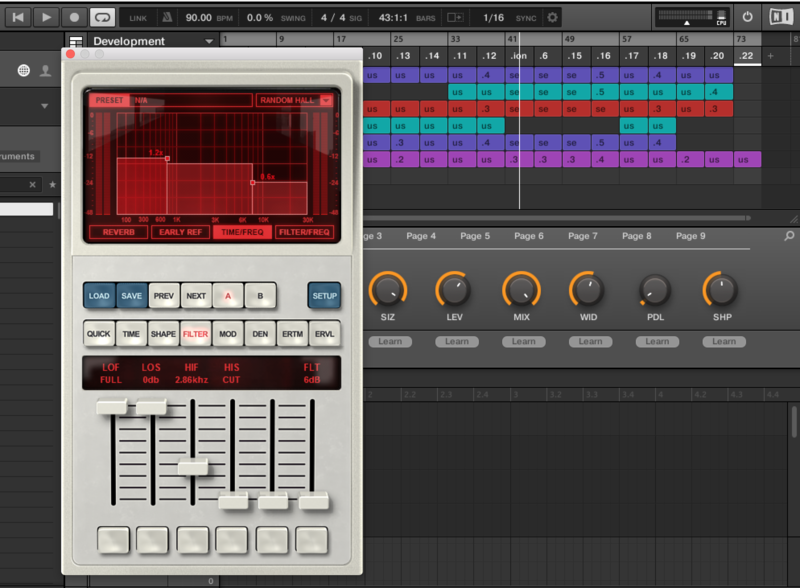 The Reverb tab includes decay controls, color parameters and decay multipliers. Within the decay controls the user can manipulate the reverb time, diffusion, pre-delay and size. The size parameter unique to the VSR S24 because it is specially tuned to reduce unwanted coloration/resonances when using small sizes. Each setting could be considered a separate reverb engine. The Mod tab is built up of three controls: Reverb/RevMod Type, Rate and Depth. The 'Reverb/RevMod Type allows the user to select the sort of modulation they would like to apply to the diffuse field reverb portion of the signal. 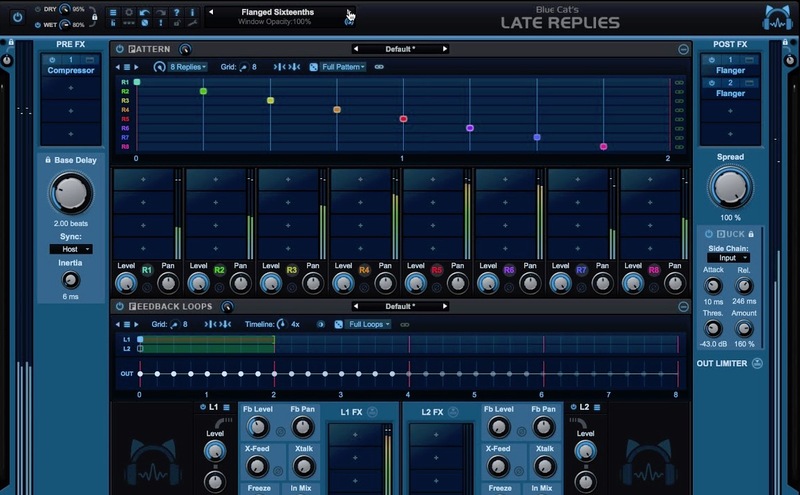 With several options the user can experiment with the parameters, having the capabilities to create fruitful long reverb tails. The 'Rate' control allows the user to adjust the rate of the reverb modulation. The 'Depth' control allows the user to adjust the depth of the reverb modulation. Faithfull algorithm recreation: reverb algorithms from the legendary Lexicon 480L (Random Hall, Hall, Room/Plate, Random Ambience and Twin Delays). 4 routing configurations with different algorithms in each engine for extremely wide reverberation. Extensive selections of Early Reflection patterns, ranging from studios to various concert halls. Customizable Early Reflection section: front/rear direction controls. Selectable reverberation engines and characteristics: True stereo operation. Up to 5 engines with separate controls. 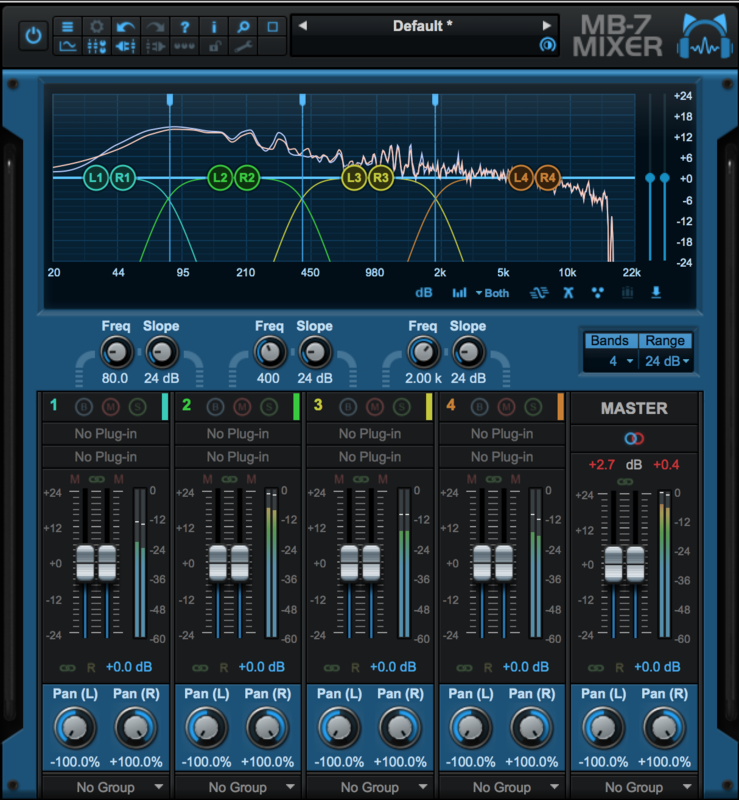 Enhanced parameter range: extensive modulation range and continuous parameter range. 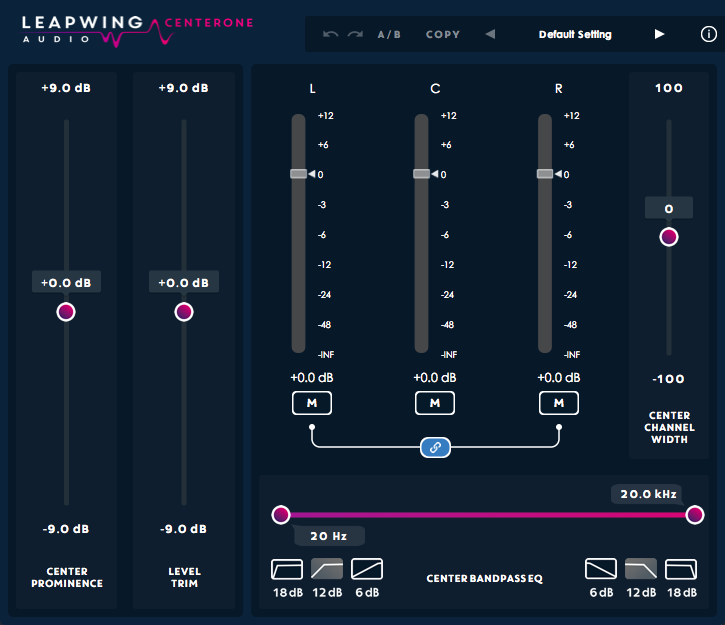 Relab Development’s reverb bundle packs a punch. Including two incredible reverbs that capture the essence and quality of legendary reverbs. 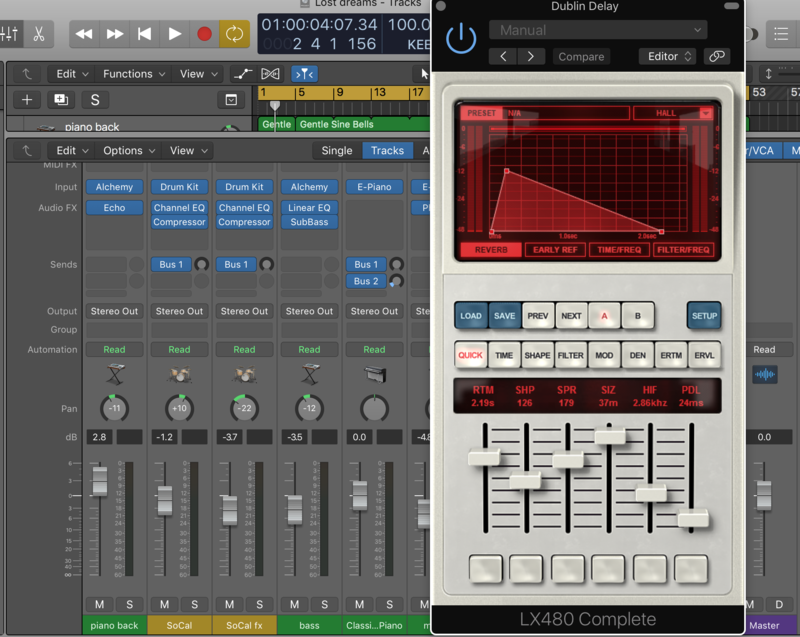 Relab makes it accessible for any producer, composer, audio engineer, etc. to own some of the highest quality reverbs on the market. Lately, my projects have been ambient based, thus making reverb an essential part of my workflow whilst producing. I have used several different reverbs over the past few months and I can say with confidence both the LX480 and the VSR S24 are incredible. Both have intuitive GUIs making it easy to navigate and control your parameters. The presets are detailed and organized making the process of finding a starting point painless. The options are endless. I can create any reverb imaginable. One of my favorite things about both reverbs is how quick I can get quality results. 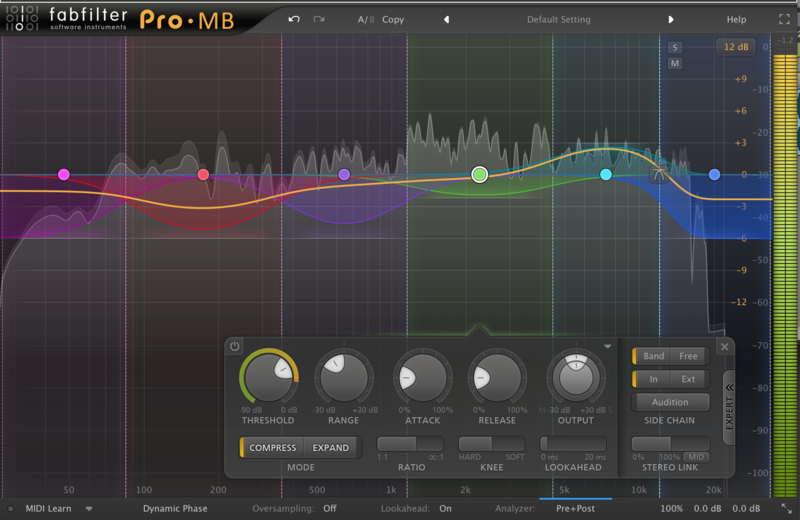 When first testing the bundle, I began by trying different presets on some of my drum loops. Both the LX480 and VSR S24 gave a new life to my drums I have been unable to capture with any other reverb. My favorite feature of the LX480 is the ‘setup’ button. As discussed above, the ‘setup’ button gives you four options for how you would like ‘A’ and ‘B’ to interact with one another. The option I find myself using the most is the ‘stereo split’ option, which combines ‘A’ and ‘B’ output. 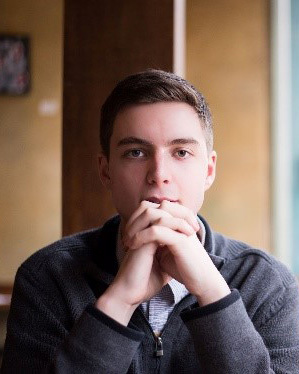 Really cool for making long tail reverbs with echoes. My favorite feature of the VSR S24 is the ability to choose specific locations and rooms; furthermore, the ability to pick the front or rear position of any given location. My favorite combination so far is the ‘rear’ of ‘jazz club.’ Overall, both the LX480 and VSR S24 are quality plug-ins. If you are looking to take your use of reverb to a new level of quality, I highly recommend getting Relab Development’s reverb bundle.